Note: Compare today’s time and weight to October 26, 2015 and May 9, 2016. Although the workout is programmed at 95lb., and 65lb., find a weight that the 6 Power Snatches and 4 Squats Cleans can be consecutive (ie. scale down if required). All techniques will be reviewed in class. This is a deceivingly challenging training session! Join Greg Amundson for a potentially life-saving Krav Maga Seminar on the principles of defending yourself or a loved one against a threat with a Long Gun (Rifle / Shotgun). In addition, learn the foundational combatives of Krav Maga, the Israeli Military system of Self Defense. 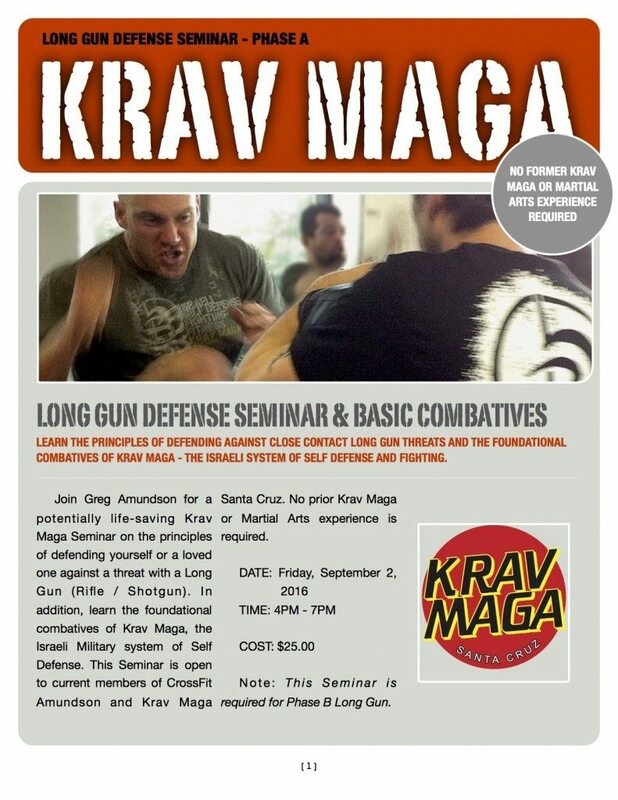 This Seminar is open to current members of CrossFit Amundson and Krav Maga Santa Cruz. No prior Krav Maga or Martial Arts experience is required. Seminar date is Friday, September 2, 2016, from 4:00 PM – 7:00 PM.